The B. Y. High Class of 1969 has announced its 50th Anniversary Reunion for Saturday, July 6, 2019. It will be held at the home of Mike Brown, located at 10466 North 4800 West, Highland, Utah. The reunion will begin at 6 pm and will run to 9 pm or later. A donation of $30 per person will cover reunion expenses. Please send RSVPs to Rich Reinschussel and Reunion Committee members at rreimsch@gmail.com. Be sure to specify who will be attending, including guests. Thanks to Rich Reimschussel for this photograph. 1. David Andrews; 2. Mark Ashworth; 3. Kathleen Bateman Peterson; 4. Nancy Cannon Jensen; 5. Chris Darais; 6. Sylvia Spears; 7. Rick Beckham; 8. John Edmunds; 9. Robert Earl; 10. Jim Beagles; 11. Richard Reimschussel; 12. Ronald Robison; 13. Barbara Babb Johnson; 14. Steve Soffe; 15. Michael Eastman; 16. David Cunningham; 17. Lynette Andersen Lewis; 18. Ivan Hullinger; 19. Michael Patton; 20. Evelyn McAffee Rushton; 21. Kathy Swenson Graf; 22. Kris Apostol Cunningham; 23. Lesley Strong McLaughlin; 24. Michael Brown; 25. Jeffrey Keith; and 26. Dave Jacobs. Hover cursor over the photograph for identifications. Please find attached an invitation to our 40th anniversary class reunion which is being held on July 3rd, from 5 pm to 8:45 pm in the Academy Building. As a reunion committee we have now located 52 of 63 potential classmates and have had requests from several others to attend. Please read the announcement and RSVP as directed. We are very excited to see everyone. It has been fun working as a committee to pull this off and we hope all that can attend will make an extra effort to be there. I'm sure seeing Dave Jacobs, Mike Brown and Mark Ashworth up to their old antics alone will make your trip and time worthwile. We know that not everyone will be able to attend on this date. It was a difficult decision to pick a date knowing that some class members could not attend on that date. We are sorry we could not meet everyone's schedule. If you cannot attend we welcome any written or video comments you might like to share with your fellow classmates. We would love to hear a synopsis of what you have been doing for the last 40 years. Please forward any comments you would like to either Rich Reimschussel or Kathy Swensen Graf. P.S. We are still trying to locate: Rex Anderson, Roy Christensen, Anne Barton Giffen, Bruce Evans, Kenneth Johnson, Lorna Knight Lane, Pamela Orton Christensen, Polly Parcell Bishop, Lilia Rubio, Ranae Meredith Webb, and Nadine Vincent. If you have any leads how we can find any of these classmates please contact Rich Reimschussel. Thanks to Kathy Swensen Graf for photo. 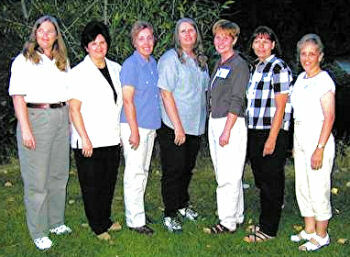 Girls, Left to right: Sue Oldroyd Pyne, Nancy Cannon Jensen, Evelyn McAffee Rushton, Jill Frischnecht Andrews, Jolene Barlow Thompson, Renae Meredith Webb, Kathy Swensen Graf, and Sherry Peterson Curtis. Boys, Left to right: Rich Reimschussel, Jeff Keith, David Earl, Larry Simonson, Mike Eastmond, Steve Soffe, Rick Beckham, Phil Andrus, Jim Beagles, Mike Brown, Brent Harmon, and Rick Shumway. One of the Brigham Young High School "Ghost Classes" held its 32nd-year reunion on Saturday, July 1, 2001. Not one student from that future "Class of 1969" officially graduated from Brigham Young High School as a senior. This photo of the Class of 1969 was taken during 1956-1957, while in Kindergarten at BY Elementary School. The Kindergarten teacher is not pictured - she was probably taking the photo. Hover for ID numbers; click on the photo for larger version. 1. LeAnn Jones, 2. Cynthia Petty, 3. Kim Hanson, 4. Steve Nelson, 5. _______ _______, 6. Margie Dixon, 7. Sue Oldroyd, 8. _______ _______, 9. Annette Larsen, 10. Gary Zabriskie, 11. Christopher Darais. 12. Deborah Kezerian, 13. Richard Reimschussel, 14. Stephanie Dorius, 15. _______ _______, 16. _______ _______, 17. _______ _______, 18. Ellen Shelton, 19. Camden Caldwell. Special thanks to Rich Reimschussel for this photo and the identifications. This is a photograph of the Class of 1969 taken during the 1957-1958 school year, while in the 1st Grade at BY Elementary School. Hover for ID numbers; click photo for large version. 1. , 2. , 3. , 4. , 5. , 6. , 7. , 8. , 9. , 10. , 11. , 12. , 13. , 14. , 15. , 16. , 17. , 18. , 19. , 20. , 21. , 22. , 23. , 24. . Thanks again to Rich Reimschussel for this photo and the identifications. This is a photograph of the Class of 1969 taken during the 1958-1959 school year, while in the 2nd Grade at BY Elementary School. You can see the chalk eraser marks on both sides of the doors! Hover for ID numbers; click photo for large version. 1. June Carlisle, Teacher, 2. Kim Hanson, 3. Camden Caldwell? 4. Richard Reimschussel, 5. Kathy Collins? 6. Christopher Darais, 7. Mark Ashworth, 8. Gary Zabriskie, 9. Ellen Shelton, 10. Margie Dixon, 11. Sue Oldroyd. 12. LeAnn Jones, 13. Jay Miller, 14. Gavin J. Andersen, 15. Stephanie Dorius, 16. Patsy Wilson? 17. Anne Monson? 18. Steve Nelson, 19. John Empey? 20. Debra Philips. 21. Martha Hales, 22. Sylvia Spears, 23. Jay Kennedy, 24. Cynthia Petty, 25. Donnie Riggs, 26. Rick Beckham, 27. Marilyn Wolsey, 28. Larry Simonsen, 29. Deborah Kezerian, 30. Gary Taylor. This is a first photograph of the Class of 1969 taken during the 1960-1961 school year, while in the 4th Grade at BY Elementary School. Hover for ID numbers; click photo for large version. 1. , 2. , 3. , 4. , 5. , 6. , 7. , 8. , 9. , 10. , 11. , 12. , 13. , 14. , 15. , 16. , 17. , 18. , 19. , 20. , 21. , 22. , 23. , 24. , 25. , 26. . This is a second photograph of the Class of 1969 taken during the 1960-1961 school year, while in the 4th Grade at BY Elementary School. The two photos were apparently taken on the same day -- note everyone is wearing the same clothes in both photos. Hover for ID numbers; click photo for large version.